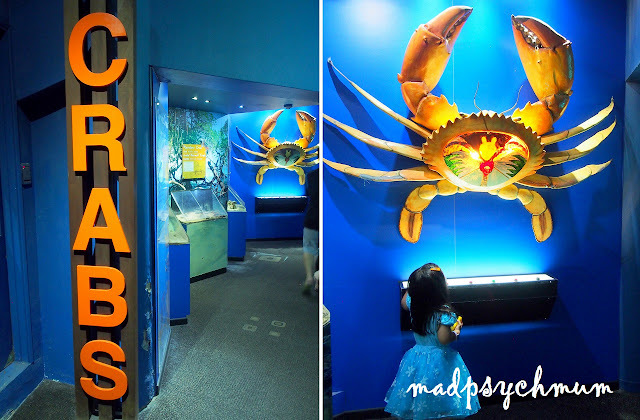 It's the school holidays, that's why Underwater World Singapore (UWS) is giving its local visitors a bundle deal which includes an entry to UWS, a buffet at Island Cuisine and other perks for just S$19.90* (see end of post for terms and conditions of promotion). That's 65% off the original price! We were told to arrive early so that it was less crowded. Added to the fact that it rained very heavily that morning (almost thought that it would ruin our day), the place was still quite deserted when we arrived at 10.30am. We went straight to the Dolphin Lagoon first as the 11am show was about to begin. In the good ole days when the hubby and I were still dating and Sentosa was one of our hangouts, the Dolphin lagoon is its own attraction located between Tanjong Beach and Palawan Beach (yes, that far away!). Nowadays it has been relocated to UWS. 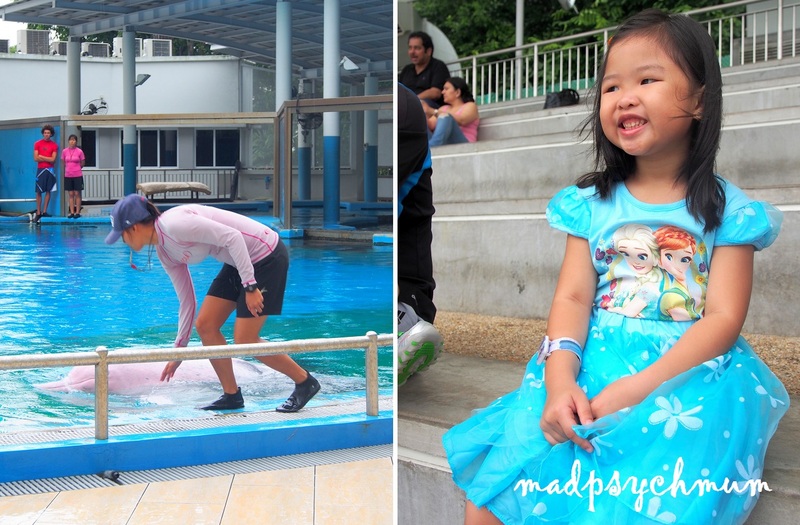 The dolphins are the same (still pink and very cute) but the arena is a lot smaller and less natural (no seaview). I ignored the light drizzle and chose to sit right infront so that I can see the dolphins up close. So pink, my favourite colour!! It doesn't look like a typical dolphin, does it? Still cute though. 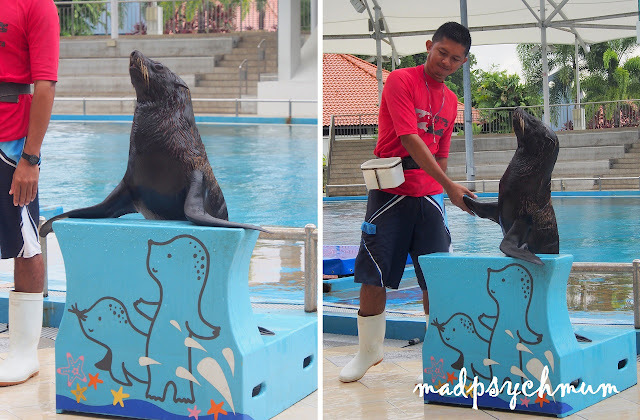 Nowadays, the show also included two very adorable and narcissistic seals that are constantly trying to get you to clap for them. "Yes hi everyone, I'm a seal!" "Look at how high I can jump!" This looks exactly like something we see on a circus ticket. Good job seal! Was up close and personal to all the action! Although the seals were amazing and very good at their craft, I personally felt that the pink dolphins should have been given more "air time" in the show. The dolphins at the old Dolphin Lagoon used to do a lot more tricks and the focus was on them. Maybe they didn't want to overwork them, which I can understand. 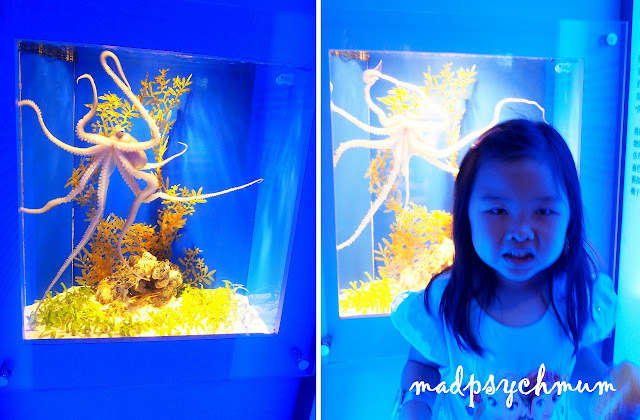 After the show, we explored the Underwater World, which has not changed much since the last time we were here in 2006 (almost 10 years ago!). The touch pools are still the highlight of the visit and even I got to touch the small shark and stingrays. Girl didn't dare to touch the stingray but she did hold the starfish. We know because the hubby tried. Just as well. Girl has grown up so much! The Sea Angel is sooo tiny! Girl enjoyed the tunnel very much and clamoured to go again and again. Baby Boy fell asleep though. The blue waters must be very calming. 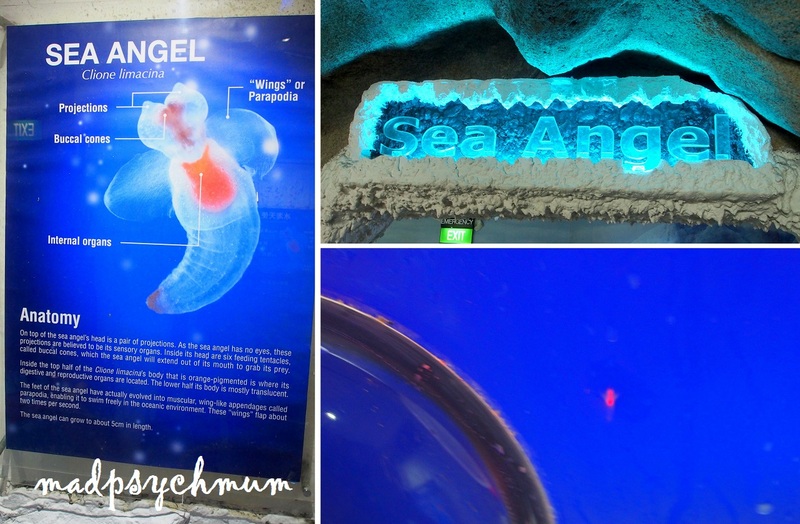 In the famous tunnel that gives Underwater World its name! 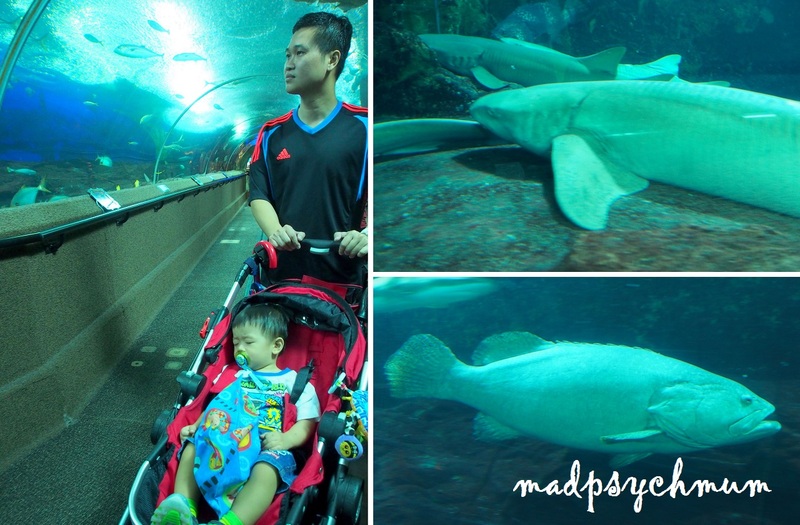 Hubby and I noticed that the fish, sharks and stingrays were huge! Larger than when we saw them 10 years ago. I don't know if these are the same fish but they sure got big! You know it's lunch time when your stomach is growling! 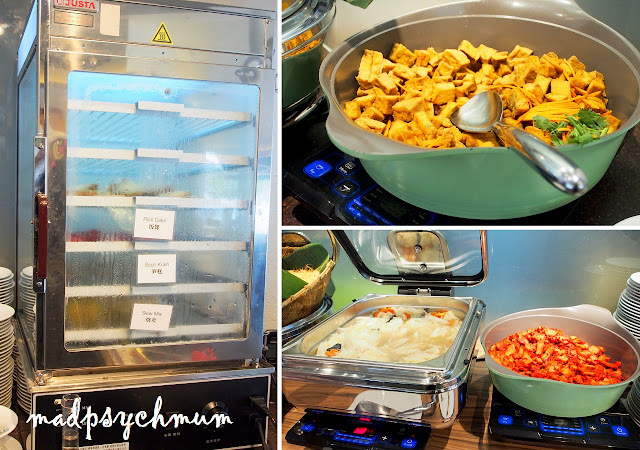 We had a nice lunch buffet at the Island Cuisine, located right next to UWS. For the price, the buffet spread was not too bad. Our favourite? The Otah! There wasn't a lot of food that my girl can eat though. Most of the dishes had chilli in them. My girl ended up just eating a bowl of soup, a little bit of beehoon, a bit of kueh, a few pieces of nuggets and that was it. Then again my gourmet food taster has above average standards when it comes to food so it might not be the same for your child. She did enjoy the ice cream at the end of our meal though. Not spectacular but good enough. Check out UWS June Holiday Sum of Fun Promotion for more details on this bundle. This promotion ends on 28 June 2015 so do purchace your tickets before then! 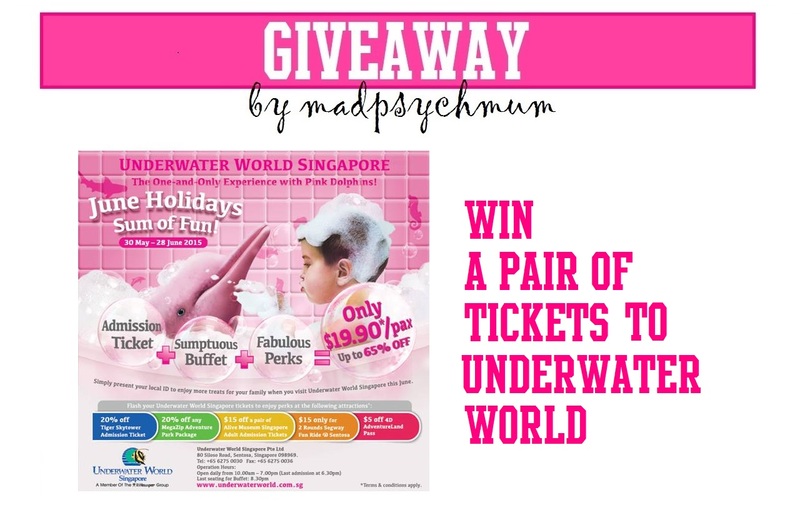 For those of you who would like to try your luck, we are giving away 2 tickets (which permits complimentary entry into Underwater World Singapore and a one-time buffet at Island Cuisine) to FIVE lucky winners each! This giveaway ends on 21st June 2015 (Sunday) and is only open to readers living in Singapore. Participants must complete the entry above and enter it into Rafflecopter in order to qualify. Other entries entered into Rafflecopter must also be completed (I do check!). Incomplete entries will be disqualified without notice. Limited to one participation per person (i.e. no multiple emails for the same person). Facebook or Instagram accounts with little or no friends (i.e. started for the sole purpose of joining contests) will be disqualified without notice according to the discretion of the organiser. Limited to one prize per household. The winner will be drawn randomly via Rafflecopter and must respond within 48 hours after being contacted by me otherwise another winner will be drawn. Winners must utilise their prize within 3 months after receiving the tickets. Each winning ticket does not include the additional perks as stated in above poster. Tickets are only valid for communicated date of visit. Winners must retain and present the invite for entry to UWS and to redeem buffet meal at Island Cuisine. Tickets can only be used once. Promotion is only applicable to local residents of Singapore. (i.e. Singapore Citizens, Permanent Residents, Holders of Employment Passes, work Permit or Dependent's Pass). This promotion is not applicable with any ongoing promotions or group tours. This promotion is only valid for watching the dolphin show. Charges are applicable should visitors wish to participate in the dive or have contact with the dolphins. 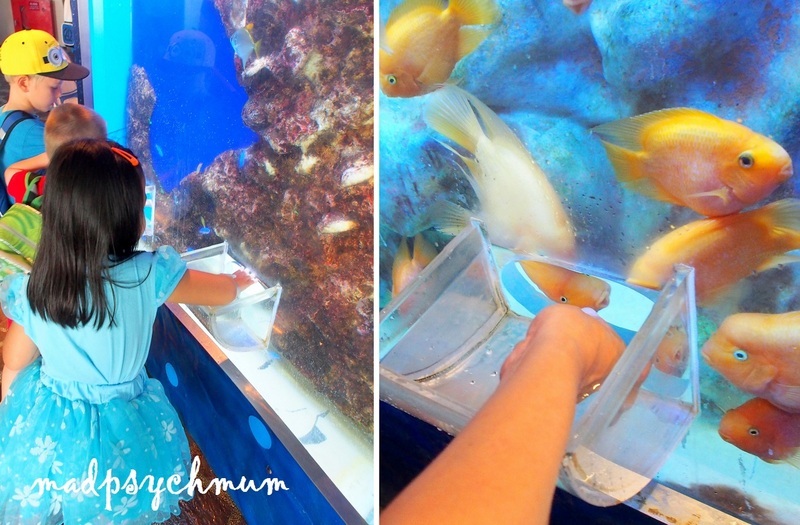 The point-of-exchange for promotion is at Underwater World Singapore ticketing counter. Island Cuisine will offer local delicacies in a buffet format daily from 11.30am - 3pm (Last seating: 2.30pm) and 5.30pm - 9pm (Last seating: 8.30pm). Island Cuisine is not a halal certified restaurant. Dishes do not contain pork/lard. Disclosure: Complimentary entry tickets and lunch were received from Underwater World Singapore for the purposes of this review and giveaway. No monetary compensation was received; all opinions are my own.